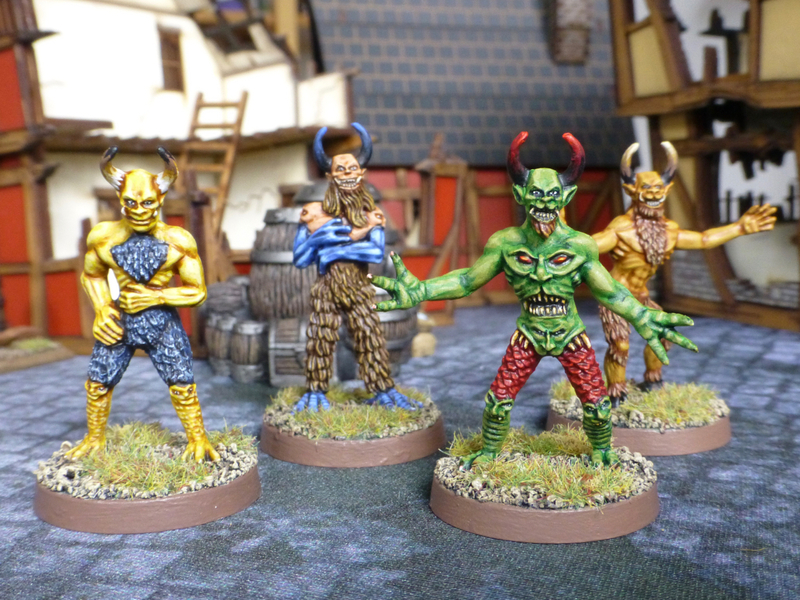 I pledged for the Medieval Demons by Antediluvian Miniatures in 2017 and just made a start by painting up the first group. The sculpts are crisp and the white metal castings are very clean so I highly recommend this range. Based on drawings of demons in medieval manuscripts, I intend to field these as the retinue of a powerful Daemon Prince of Tzeentch using Saga 2 rules or against actual historical fighters of the era. With their faces leering from various body parts, colourful skin tons and bird like features, such medieval depictions of the forces of hell must have had a big influence on the Changer of the Ways in Warhammer lore. This entry was posted in Medieval, Warhammer and tagged Antediluvian Miniatures, Chaos, Daemons of Chaos, Tzeentch, Warhammer. Bookmark the permalink. Thanks, it was fun working in those rather uncommon colour combinations for a single unit. I am preparing the other three groups now and will work away on them when I am in the mood for some skin highlighting. Thanks, their strangeness was really appealing, and combining fantasy and history, they had to be mine! They’re brilliant mate – I did fancy those myself, but couldn’t really think how I would paint or use them… Seeing your bright interpretation is a joy! Cheers, the paint jobs on their site are great and provided my inspiration, together with images from medieval manuscripts, which the sculptor and painter will have used themselves. Still got some way to go with the figures I have, but I do hope the range will expand regardless. Nice figures and painting. That one figure gives a new twist on the term “Talking out of your Arse…”, lol. They are neat. I particularly like the yellowish skin you did on the one and the unusual color combinations work for me as well. Thanks, the yellow guy was the first I finished, I also thought it came out nicely. Will definitely use that skin tone again. You did a great job on those, the blue armed guy is particularly nice. I was tempted by that range, I must say. Cheers, he looks pretty deranged! 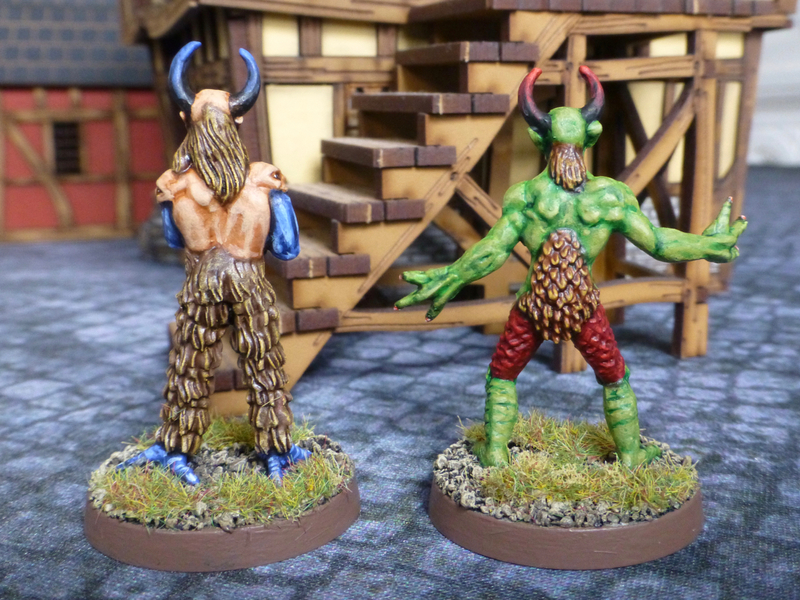 Antediluvian Miniatures struck me as a manufacturer that could tickle your fancy. I think I have to get some of their 19th century interpretations of popular dinosaurs too. Excellent work on those. 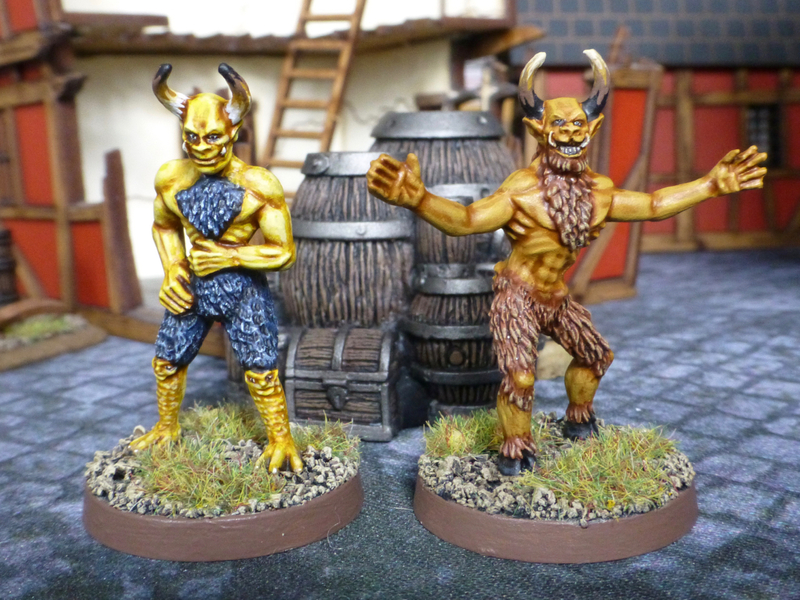 Love the skin tones and fresh or historical take on the demon kind. Those unexpected faces came out really well and you really draw the eye to them. Wow, truly outstanding. You’re right about the crispness, but your painting here and the colors you used made these babies pop. Thanks for posting! Thank you! It is a fun and unusual collection to work on (something you would know all about! ), and there is more to come including a big guy. Completed my modular caverns on H.A.W.K.S.